Owing to the expertise of our team of experienced professionals, we are able to introduce an exclusive range of Lip Seal Kit. The kit is designed to bridge the gap between conventional elastomer lip seals and mechanical face seals. The offered kit provides lower friction and generates less torque, less heat, and requires less power. This kit finds wide applications use in conveyor rollers, electric motors, rolling stock, generators, compressors, and vacuum pumps. 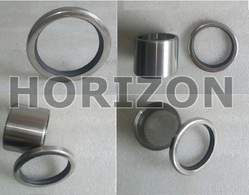 Besides, clients can get the kit from us at industry leading prices.